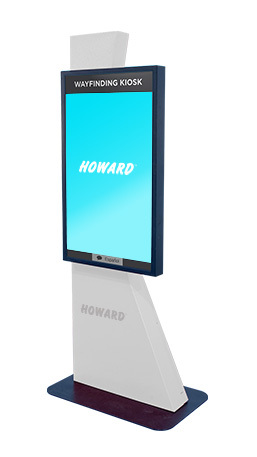 Howard Wayfinding model kiosks incorporate a user-friendly platform to help customers and visitors find their way. In addition to enhancing the customer's overall experience, the device can also alleviate reception staff of wayfinding duties in favor of other tasks, increasing workplace efficiency in the process. Wayfinding kiosks can also be configured to promote additional services, specials and websites. Help users navigate their destination and encourage them to explore the surrounding area. Howard is proud to partner with 22Miles and feature Waytouch Premier™ in our Wayfinding Kiosks. It is a tried and tested, all-inclusive, Award-Winning interactive wayfinding solution. Wayfinding Designer—Allows the end client to design their own wayfinder with no coding experience required. Directory List with Search—End users can find their desired location by searching for it. Written Directions—In addition to a line path, provide text turn-by-turn directions from location A to B. Database Fed Directories—Databases allow for directories to be easily updated. For example, if Julie moved from the first floor to the second floor, and update could be made by searching the database for Julie and updating her information. Scheduled Pathing—The paths displayed for a destination can be scheduled to change at a specific time. For example, in a hospital you could have pathing to patient rooms available only during visiting hours. Intricate Pathing Views—Views that are more than just bird's eye. Mobile Takeaway Wayfinding—Through SMS, QR or email, the end-user can take the directions with them away from the kiosk using their phone. 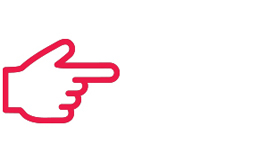 Mobile Web Wayfinding—End users can open an interactive web version of the wayfinder on their phone with no installation required. Mobile Native Wayfinder—Give the user the "blue-dot" experience, updating the user's location as they move through the facility like a GPS. 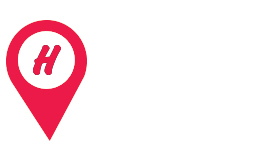 Beacon Support—Used with Native Mobile Wayfinding to update the user's location as they move through a location as well as give location-based advertisements. 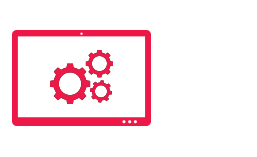 Cisco MSE (CMX)—Like beacon technology, but uses Cisco routers and access points to determining the location of an end-user using a mobile wayfinding experience. 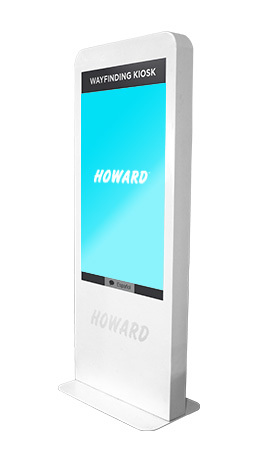 The Howard Wayfinding kiosk is a user-friendly platform to help customers find their way.